This article was published on 04/28/2018. RPG stands for "role-playing game," which generally describes a game with turn-based combat and leveling up, such as the classic Final Fantasy titles. Naturally, there are variations to the definition, but that's what most people mean when they say RPG. At least, that's what I mean when I say it, especially for the purposes of this article. Speaking of, this article is going to be a detailed account of my first time ever experiencing the RPG genre. That may not sound very interesting, but my first encounter with RPGs is rife with comedic moments that I'd like to share. As for the RPG in question, I think it technically might have been Super Ninja Boy for the Super Nintendo Entertainment System, but I don't count that as a proper RPG and therefore won't discuss it here. Plus, my experience with that game isn't worth recounting. 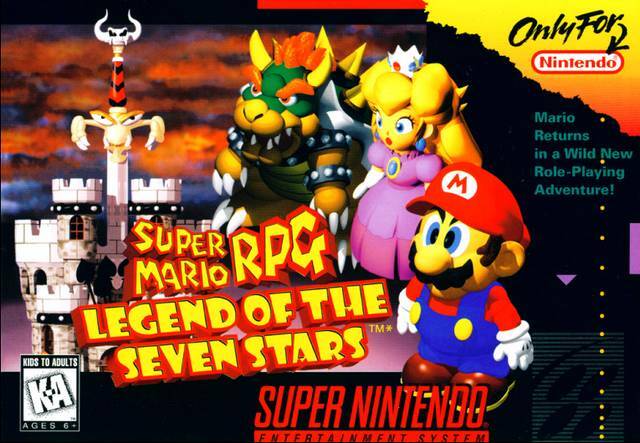 Rather, my first actual RPG was Super Mario RPG: Legend of the Seven Stars for the SNES. I'll be making direct references to stuff in the game, so hopefully you've played it by now. 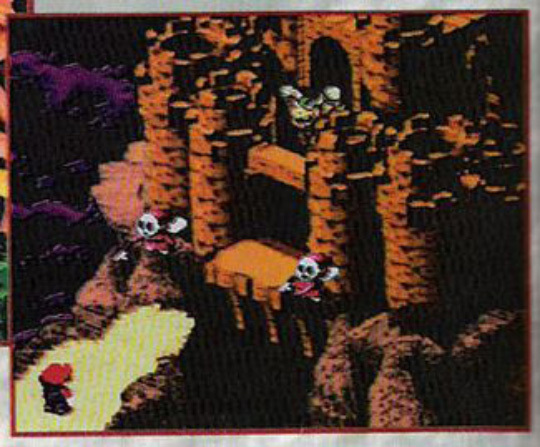 Before it came out in 1996, I read about Mario RPG in the official Nintendo Power magazine. I vividly remember seeing a number of screenshots for the beta version of the game, which looked a little different from the final product. Back then, I had no idea what an RPG was, but I was a huge Mario fan. I had played all the mainline Mario games available at that point in time, and loved most of them. As such, I was extremely excited for the impending release of Mario RPG. 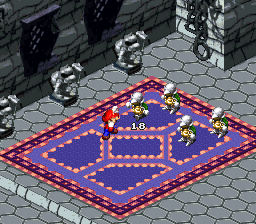 At the time, I thought Mario RPG was going to be Mario's first foray into 3-D platforming, because it had an isometric perspective and pre-rendered graphics. This was back when many people incorrectly referred to pre-rendered graphics as 3-D, and I was one of those people. Little did I know that Mario RPG was something else entirely, as Mario's first true 3-D game, Super Mario 64, didn't come out until later. The wait for Mario RPG was brutal. It was one of the first games I knew about prior to its release, which introduced me to the whole video game hype cycle. My mom literally called stores every day asking if the game had come in yet, and each call filled me with greater anticipation, but also greater disappointment, as they usually said no. The reason for the constant calls was that we didn't know the exact date the game would be released. I can't recall if this was because I accidentally skimmed over the release information in Nintendo Power, or if it was due to that information simply not being available yet. Either way, my mom probably annoyed the heck out of countless customer service representatives. I'm thankful she was so supportive of my weird Mario addiction, but I do feel sorry for those Toys "R" Us and Walmart employees. 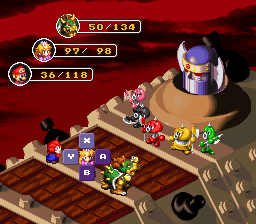 When I finally got my hands on Mario RPG, it was unlike anything I had ever experienced before. Not being familiar with any of the genre's conventions, my first moments with the game were filled with confusion. The very first thing I did was jump on an enemy's head, because that's what I knew Mario to do. To my surprise, I was transported to a different screen where I watched as Mario and his foe took turns hitting each other. I figured out the timed hits thing real quick, because I constantly pressed buttons during battle in a mostly vain attempt to control the characters' actions. The numbers on display initially puzzled me, but I quickly figured out that they represented health. My thoughts at this point were, "Do I have to do math? I hate math!" Suffice it to say, I wasn't too thrilled with the game at first, but I eventually grew to like it. While Mario RPG was explicitly designed for newcomers to the genre, kid me took forever to figure out some of its most basic mechanics. Despite the presence of a tutorial explaining how to equip stuff near the beginning of the game, I had no idea how to put on weapons and armor, or that doing so even did anything. It wasn't until Rose Town that I realized you could equip stuff, and even then, I didn't get the point. I remember buying and equipping some clothes for Mario and being dumbfounded when he looked the same. You see, I thought that these were just costumes to alter a character's appearance, and that they had no other effect outside of that. Think Super Mario Odyssey. Having felt as if I had wasted my money, I immediately removed the armor I just purchased for Mario and sold it back to the same store I got it from. I then proceeded to ignore equipment for most of the game, though I did somehow manage to equip Mario's first hammer. One of the most fundamental aspects of an RPG is leveling up, and this is another thing I didn't figure out until late in the game. 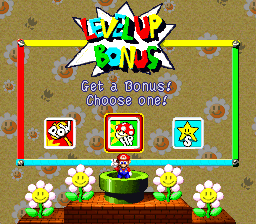 Whenever you level up in Mario RPG, you're shown a screen where you can put bonus points into stats of your choosing. 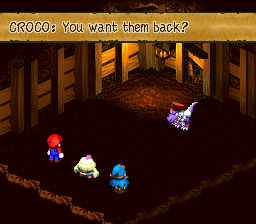 For nearly the entirety of my first play through of Mario RPG, I thought this screen meant that I was randomly warped to a bonus area. It frequently occurred when I grabbed a star, so I associated it with that. Additionally, I thought the selectable bonuses were temporary prizes as opposed to permanent stat buffs. I didn't know what the "Power" or "Special" bonus did, so I always picked the HP bonus, erroneously thinking that it merely fully recovered my health. Outside of HP, I had no idea what any of the numbers in the status screen meant, or that my characters were getting stronger through fighting battles. As a result of that, I ran away from almost every single battle. Combined with the fact that I never wore equipment, this made the game intensely difficult. I essentially did a "low level" and "no equipment" challenge without intending to. Through my stupidity, I discovered a rather clever exploit involving the "Pick Me Up" item in the game. These items are like the Phoenix Downs from Final Fantasy, in that they revive one of your fallen comrades. However, Phoenix Downs only bring back characters with a tiny bit of HP, whereas Pick Me Ups revive them with full HP. Further, Pick Me Ups could be bought at almost any shop in the game for cheap. They're even cheaper than most items that heal comparatively less HP, and those items don't have the added benefit of reviving people. I exploited the heck out of this fact by completely maxing out my inventory with Pick Me Ups; I never bought any other items. See, because I never leveled up or equipped anything, my characters would often die in one hit. My near unlimited supply of Pick Me Ups mostly solved this problem, though. So long as a single one of my characters stayed alive, I could continue reviving everyone else until I won the fight. Everything was going swimmingly until I reached the second Croco fight in the Moleville Coal Mines. This was the first major stumbling block I encountered in the game. 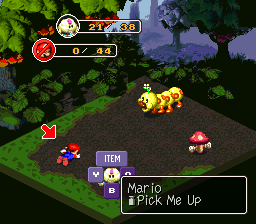 Those of you who've played Mario RPG before will undoubtedly know why. Halfway through this fight, Croco will steal all of your items, and I do mean all of them. That includes all the Pick Me Ups. Considering my strategy to get through tough fights relied so heavily on Pick Me Ups, I was put in a serious bind. I had to make do with Mallow's pathetic HP Rain special move, but that barely helped, because Croco would occasionally kill some of my characters in one hit. Being that he had the lowest HP, Mallow happened to be one of those characters. My victory hinged on whether or not Croco targeted Mallow with his strongest attacks, so it all came down to luck. It was quite a struggle, but I pulled through. Before Mario RPG, I primarily played side-scrolling platformers, and these games rarely contained text. In the unlikely event that they did, I'd skip through the text as quickly as possible. I hated reading as a kid, because I was bad at it and found it boring. 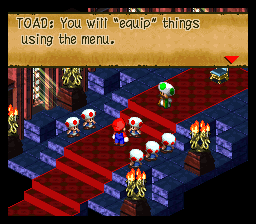 Because of that, I skipped most of the text in Mario RPG, only reading a few snippets here and there. That likely explains why I had so many problems with the game. This eventually led me to getting stuck in Marrymore. 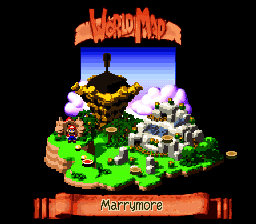 Normally, when you get to the end of an area in Mario RPG, the next area opens up on the map screen. However, once you're done with Marrymore, you have to backtrack to an earlier point in the game in order to open up the way forward. The text tells you this, but since I didn't read it, I didn't know. For a while, I thought I had encountered a glitch that prevented me from progressing. Hopeless, I quit the game for a large period of time. I did eventually unlock the next area, but had no clue as to how. 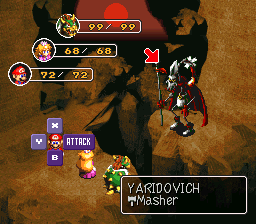 After finally making my way past Marrymore and the Sunken Ship, I got stuck at the Yaridovich fight in Seaside Town. This was the second major boss I had a lot of trouble with. His infamous "Water Blast" attack would often kill my whole party in a single hit, totally neutralizing my Pick Me Up strategy. Even when it didn't, the guy could kill my characters faster than I could revive them. Similar to the Marrymore situation, there was a point where I had completely given up hope, and took an extended break from the game. Eventually, though, I beat the boss by the skin of my teeth. Honestly, I have no idea how I actually managed to take down this guy. I just kept trying the fight over and over until I eventually beat him, but it took me forever. This fight is hard no matter how you slice it, so it's impressive that I beat this boss with such low levels and next to no equipment. The final area I got stuck in was Barrel Volcano. Everything more or less went smoothly until I got to the Czar Dragon, where the difference in power was abundantly apparent. This thing made short work of my party, and no matter how hard I tried, I couldn't get past it. 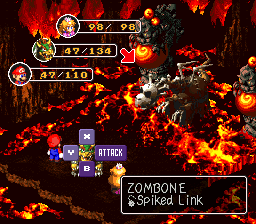 To make matters worse, this boss has a second form called Zombone, plus you have to fight the Axem Rangers shortly thereafter. It's around this point that I finally figured out what I was doing wrong. While browsing the shop at the volcano, I saw a bunch of fire themed armor, and it suddenly occurred to me that I should try wearing that when fighting the fire dragon. It was just crazy enough to work, I thought. I then beat the boss with little effort. For some reason, this obvious revelation felt like I had stumbled onto a great discovery. I was so excited that I told my younger cousin about it, who had a similar issue and was stuck at the same boss. From there, I beat the game without much trouble. That concludes the story of my first journey through an RPG. It's a silly story, but that's precisely why I wanted to share it. Now you can all laugh at my childhood stupidity. Life is a circus and I'm the clown. Thankfully, this experience did teach me a lot about RPGs, so I'm no longer as dumb as I once was. In addition to beating Mario RPG many more times, I've beaten countless other RPGs since then, and now I'm a seasoned veteran of the genre. It's all thanks to Mario RPG. 1,388,059 people love this site.